Welcome to this web site, which supports and supplements the Poppyland Publishing book A Dictionary of Cromer and Overstrand History. In practice, this site focuses on Cromer and Suffield Park; you can click on This is Overstrand to go to our partner site about that village. As the book explains, today's Suffield Park was mostly in Overstrand until 1896, so there is a degree of overlap. As is natural, much of this site will have the expectation that you already have a copy of the book; if you haven't and you'd like a copy, you can purchase it at local bookshops and museums or by going to the Poppyland Publishing web site. 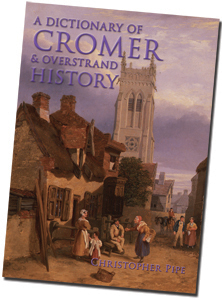 As well as A Dictionary of Cromer and Sheringham History you'll also find there a number of other books and DVDs about the area. Our modern technologies enable us to record our memories in print, in photographs, in audio format and on film and video. This site makes use of all these methods, with contributions from many residents of the town, including a number who are no longer with us. They have all generously contributed their recollections and pictures. The site also has the facility for you to contribute. Please use the Feedback facility provided if you have comments which will extend the information we've given, to suggest other characters we should know more about, to expand the history we've presented in print and online. If you're planning to visit the town, we very much hope you'll take the opportunity to visit our two museums. There's more detail on Cromer Town Museum and the RNLI Henry Blogg Museum. Yes, when there's the opportunity, it is still best to see and often handle the real artefacts! This map from Google gives you the position of Cromer out on the north east corner of the broad peninsula of East Anglia. You can use the normal Google Map controls on the left hand side to zoom in and out. The buttons top right will enable you to change the type of map you're looking at. We'll be using a number of facilities from Google elsewhere on the site. If you find you have the Google Earth facility displayed, the controls are a little more difficult to use but extremely powerful in the way they allow you to view the earth.